Just metres from Puerta del Sol in Madrid, one of the most emblematic places for Spanish people, and a must-see for any tourist passing through the city, Hotel Francisco I is found at Calle Arenal nº 15. This is an unbeatable location, at one of the best starting points for discovering the city; and with the new renovation of its rooms, it is now also one of the best places for ending the day and enjoying a gratifying rest. PORCELANOSA Group formed part of the renovation of the rooms of Hotel Francisco I, and was involved in the project of changing its appearance through a ventilated facade. The majority of the companies of the Group formed part of the change in the hotel’s appearance, making it one of the best accommodation options at the centre of Madrid. 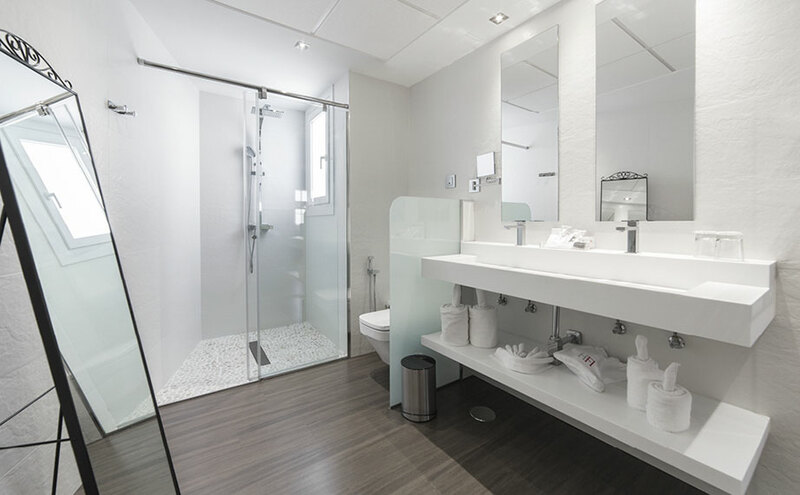 The compact Mineral KRION® is found in the 79 rooms of the hotel, in the form of special bathroom countertops, from the Kole KRION® BATH series, alongside products from Systempool, shower trays, shower screens and columns, accompanied by taps and fittings from Noken in the bathrooms. The rest of Porcelanosa Group can be seen in the flooring, with vinyl from L’Antic Colonial, coverings and flooring from Urbatek and Porcelanosa, in addition to attachment materials from Butech, which also participated in the profile for the XLight ventilated facade from Urbatek. Special KRION® countertops transformed by: Kuma Estructuras, S.L.